One of my fellow classmates, Dennis asked me to be a hair model for an interview at his dream salon to work at this past week for a technical interview. For hair stylists, when we are trying to get a job in a salon, we have to of course prove our savvy skills, so I jumped at the chance to help my friend out and be his model. I needed a hair cut and a new color too, so PERFECT TIMING! His dream salon to work at is called the Beauty Palor owned and operated by Quincy Brown, here is his Facebook Link. From the moment I walked into the salon, I felt at peace and right at home. I am very into Interior Design and fashion, and am a very visual person too. We were set up in the other room towards the back and got to work (well, Dennis got to work on my hair!) He recolored my red using INKWORKS since it was fading and then did a very beautiful assymetrical cut with layers. I am in LOVE with this SILVER SOFA! He did such an amazing job on my hair and can really work that blow dryer! Here is the finished result that I LOVE!!!! I am proud to say that Dennis got the job working at this amazing salon. Please check out their facebook page! They are located in downtown Norfolk in the "Art District" not too far from the Norfolk Scope and for those tattoo enthusiasts (like myself) Fusion Ink is a stone's throw away from The Beauty Parlor! 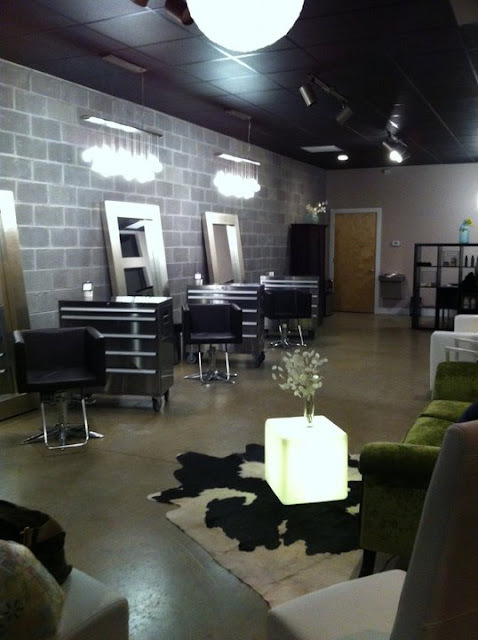 Stop by the salon, it is a cute, very chic, relaxing place to get your hair done! I know I will be going there for my haircut! I believe they offer massages as well. Check their facebook for a full list of services! As always, my Sweet Surrender readers, thank you for stopping by and stay tuned for more updates from me!